To start off our Career Exploration page, we will insert the Career Intro Writing assignment as an introduction to the career research dream job assignment. 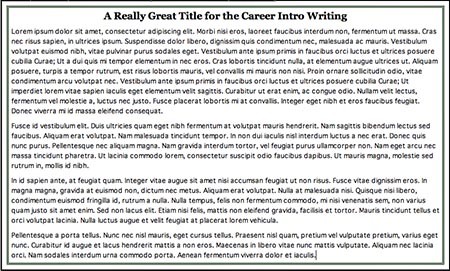 To make this a bit more visual, we will insert a nested <div> tag so the intro writing appears as an essay. Open your Career Intro Writing assignment. In the next exercise, you will insert content for the Career Exploration Dream Job research assignment.